Tiffany blue and silver skittlette nails | Light Your Nails! Yesterday I got home too late for my usual Friday blog post so here it comes now! I am sharing with you a very easy nail art I wore when I visited Cosmoprof Italy last month. My base nail polish is TNS That's Amore, on my ring finger I added a coat of Bella Oggi Strass Effect 02 over it. The chevron pattern comes from plate QA91 and my stamping polish is Essie No Place Like Chrome. The real colour is actually dustier and more green leaning. Anyway this is an easy nail art idea that you can recreate with any colour really. I find it very versatile. What do you think? Dici? In effetti le skittlette su Pinterest vanno un sacco! This is such an elegant spring look. Beautiful pairing of colors. I adore the simplicity of this look. It's very elegant and perfect for everyday wear. Super pretty mani! Love the minty color! 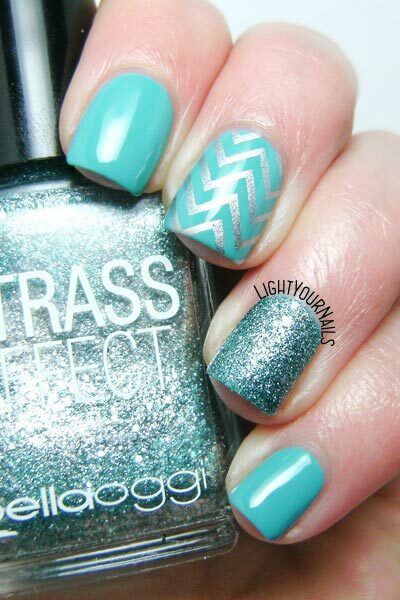 Your zigzag stamping is perfect! Thank you Kerry! It's one of my very favourite patterns. I use it very often. Grazie mille! Sul pollice avevo uguale all'anulare, con lo smalto sabbiato Bella Oggi!